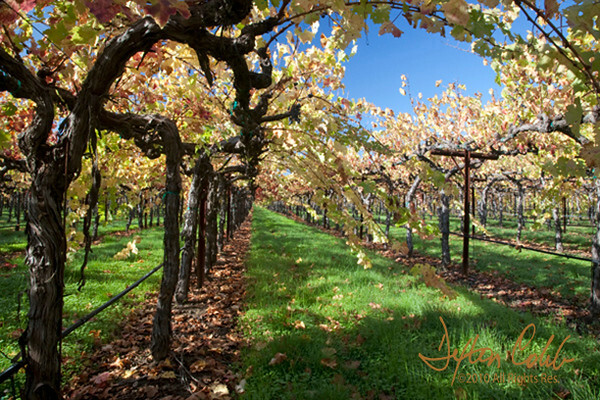 This shot was taken in a vineyard on the Oakville Crossroad in Napa Valley about 2 ½ hours after sunrise. This was a second attempt since I tried to get this shot on the previous afternoon to no avail due to unforgiving afternoon light. We rushed from Santa Rosa to Napa Valley to shoot Pine Ridge Winery on Sunday morning. But as is often the case, the sites along the way proved more rewarding than the goal. See Pine Ridge Winery in springtime here: http://contador.smugmug.com/Landscapes/Central-California-Scenery/774689_nyyYJ#521952017_4xkuy-A-LB. We passed this scene about seven miles short of the winery and made a note to return if possible before the light changed. We zoomed over to Pine Ridge and got nothing so we quickly returned to this locale. I like this scene for some unknown reason. Perhaps it’s the grape canes draping across the scene like an arbor or the wonderful blue sky. Or, maybe it's just the pleasing view. For some reason, it just works for me.